Well, as you can tell, I now have a new computer. That being said, here's my newest post. On the Saturday before last, after having spent the evening at Empire, my roommate and I got a ride home. 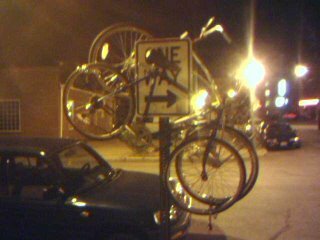 We weren't quite tired (drunk) enough to sleep and there are these two bikes that have been chained, literally around, not to, a sign post on our block since we moved into our apartment last August. We decided to see if we could lift them off, as it turns out, no, but almost. So this is what happened. And we refuse to try it sober. But now on to this week. Last night I went to see Leftover Crack at Nanci Raygun. It was an amazing show, and every time I see LOC I have a great time. Thanks to Wes for coming out even though you had homework to do, and Luke, I'm sorry you got dropped on your head so much. I got a chance to see people I haven't seen in forever, and it really felt like I was 16 again. But then I woke up this morning, and all those bumps and bruises that I shook off when I was 16 and going to shows a lot, felt a whole lot worse than they used to. Guess that's what happens when you start to get old.